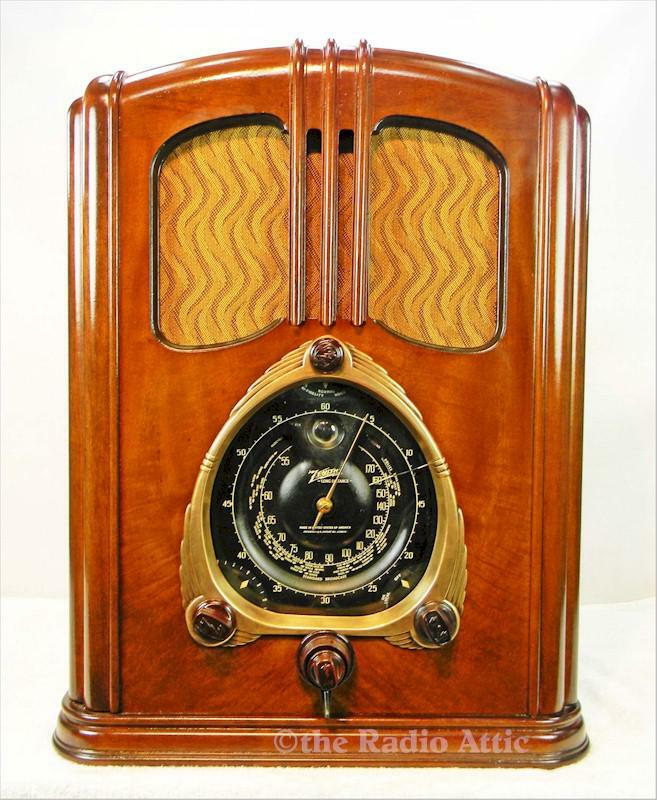 Considered as one of the most collectible of all of these old radios and displayed on the popular television program "The Waltons." These radios appreciate in value, as they are scarce and offer a dramatic quality of sound. The condition of the cabinet is a professional refinish with a high degree of duplication of the original. The speaker cloth is a highly accurate reproduction, and the knobs the iconic "Z" wood knobs. The motor works well. My tech has replaced all of the components required to update the radio and ensure that you enjoy problem free ownership. He has completely disassembled the shutter dials and cleaned and oiled them for smooth operation. Add the huge fly wheel to the tuning and you have the finest of accurate tuning. We replaced the dead eye tube with a super sensitive 6E5 eye tube. He also has added a mini-jack allowing you to connect to an external device. Use your phone, pad or computer to allow you an unlimited choice of content. A reprint of the original owners and operational booklet is included. Bluetooth is now available for $25! 23-1/4"H x 17-3/4"W x 13"D.
You are visitor number 926 to this page.